WiFi Weak Spots at Home? 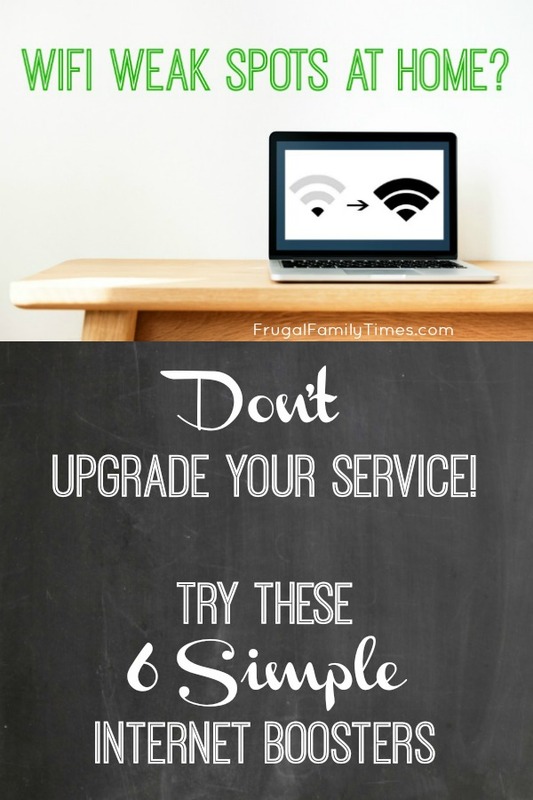 Don't upgrade your service! Try these 6 internet boosters. 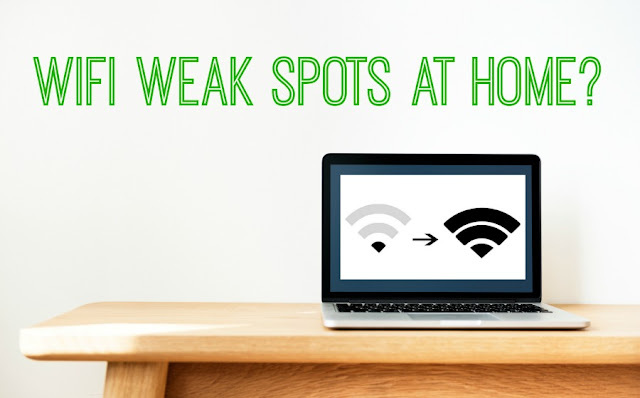 WiFi weak spots are frustrating and common. Did you know there are some simple things you can do to boost your wifi signal strength without spending much money or hiring someone? 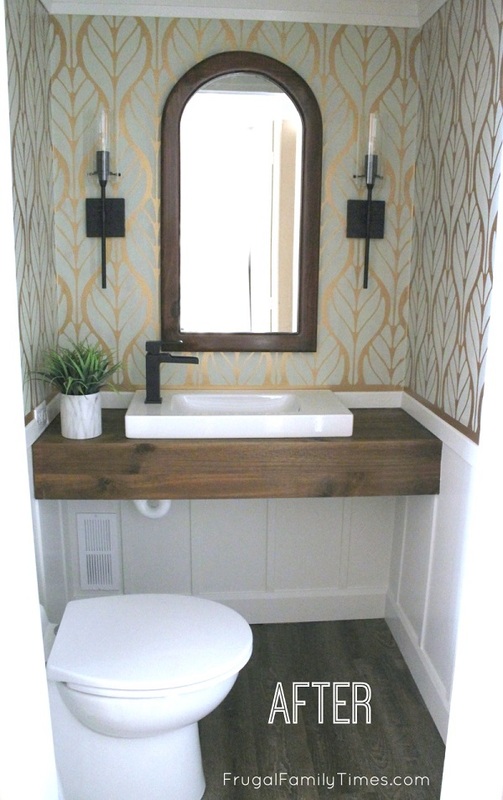 Yes - you can totally DIY your internet range! For many people, Internet service and Wifi have entered the same category as electricity and plumbing. And while I agree with the 'it's pretty essential now' part, I don't think you need to give it near the respect that people have for flowing current and water. Simply put, tinkering with your wifi signal won't get you killed or flooded. It will likely just, you know, boost your signal strength. With some experimenting, you may find that you can seriously improve signal reception in all parts of your house. I've even stretched ours to the point where it covers the front porch, back deck, detached shed/workshop and (on a good day) the kid's clubhouse in the far corner of our yard (about 80' from the router). I've done all of this with a very affordable budget router - and a few other snazzy add-ons. So before you lose it and call your Service Provider and pay for a better package or upgraded router like an expensive MESH system try some of these things first. To help you in your troubleshooting, download a WiFi scanning App like this one for Android or this one for iPhone/ iOS. Spend some time learning to read the heat zone maps it creates as you move around your house. These apps often have a bunch of other features bundled in, so don't get bogged down in all the details. I learned to use one by starting in an area with a strong signal and looking at the readings, then moving to an area with a weak signal and comparing them. Your goal will be to mess with stuff till all of the spots that you need internet look like the strong signal scan. We used one like this, free and pretty easy to wrap your head around. 2. Move the Router Antennas around. Well, step one might actually be finding your router. Try looking around where your TV or Phone cables come into your main living space. If you see a black box with some 4"-8" antennas coming out of it, you've found what you're after. Try pointing the antenna in different cardinal directions - for example, one up, the other pointing towards the centre of your house. Now use whatever WiFi scanner you've downloaded to snoop around your house and see if the dead zones have moved or improved. Try moving the antenna a couple times and rescanning, This might be all you need to do. Some routers don't have an external antenna. If this is the case for you, you can try turning it or facing it in different directions, but you'll be limited in what you can do. I live in a house where the appearance of routers and modems and other technology gets them banished to the basement. If your house has a central, main floor area (like an office, for example) and you can stand the sight of the black box with pointy sticks coming out it, move it to this new spot and see if strength improves. This does mean you will likely be unhooking some cables and unplugging the power, so make sure the new location has power and appropriate source wire (phone or cable) to plug into when you get there. Scout the spot ahead of time and take pictures of everything before you move it. Avoid boxed-in spaces, thick walls, ductwork and basically all the things that my router has around it. 4. Add an External Antenna. If your router did have an external antenna, you can try a bigger one. Wifi External Antenna s are among the cheapest pieces of signal boost you can add (anywhere from 5-20 bucks) and they generally work well. Ours has a few feet of wire, so while our router is pretty stuck in one spot, I can move the external antenna around and currently have it pointing into our backyard for summer WiFi. We've bought one like this and it has worked on two different kinds of routers over the years. Next up on the list is a WiFi range extender . Think of this as an extension cord for your internet. You pair it with your router (sounds harder than you'd think - if you can connect Bluetooth headphones, you can do this), and then plug the range extender into a wall socket just before the internet starts to get spotty. Don't go right to the edge of your signal strength to add the range extender- place it where the strength is still pretty good and it will then repeat that strength further. Another point - like an extension cord, Range Extenders are great for 1 or 2 devices to connect to, but you can bottleneck them if all of your devices are trying to use one. We bought this model and it has served us well. 6. Try updating your Router firmware, changing channels or setting it to boost mode. I've saved this step for last as it involves logging into your router dashboard and tinkering with the settings. Again, this sounds harder than it probably is for most routers (they do, however, vary wildly in ease of interface). Pretty much if you can use your phone settings screen with some degree of skill, you can likely do these things. That said if any of this stuff starts to hurt your head, it isn't worth the trouble of bricking your router or having everyone in the house yell at you when the WiFi is down for a couple days. Again, I've saved this step until last. Updating firmware involves checking with your router manufacturer and seeing if they offer a new file. You download the file to your computer, open your router settings, upload the new file and let it do its thing. You will lose internet connectivity while this happens, so keep that in mind. Next, you can change router broadcast channels. Most are set to a default which is likely the same as your neighbour's default. This can cause overlap and interference. Use your handy phone app to scan around and find a channel that isn't as popular. Switch your router to this new channel. All of your devices will follow it - so this isn't like you'll need to tinker with everything in your house. Finally, some routers offer a range boost or some similarly named mode that sends additional juice out. It may or may not make a difference to you, but flipping a switch is free and easy to try. If you're looking for more ways to save on technology - we've got simple tech tips and tutorials here. How to Tune up Your Cell Phone for Speed and Battery Life (iPhone and Android).